Join us for Chief Black Dog’s Trail Muzzleloader Club Spring Rendezvous just west of Oswego, Kansas this April 26-28, 2019. Come enjoy the sights, sounds and smells of an 1840s-era mountain man rendezvous. Primitive dress is required to shoot (no visible jeans or tennis shoes; some loaner clothes are available). 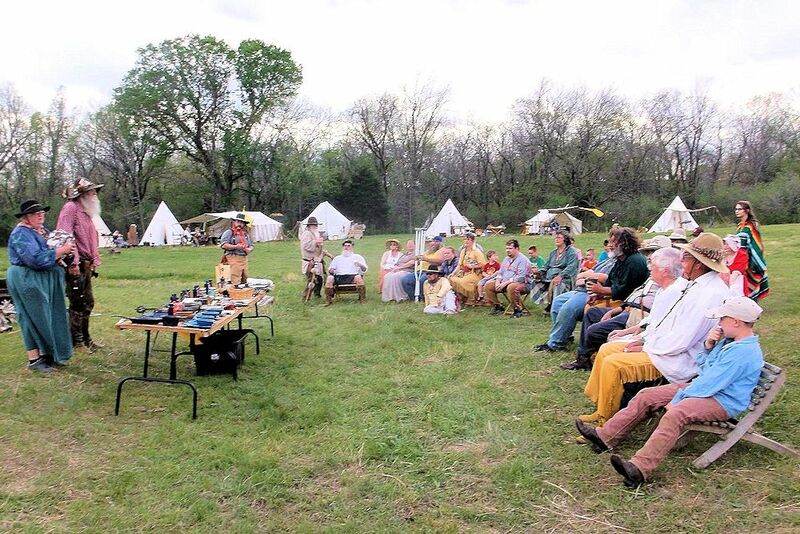 The campground for the Chief Black Dog’s Spring Rendezvous is located 1.7 miles north of Oswego, KS on Wallace Road to 14000 Road. From Rarsons go 13 miles east on 400 from the 59 and 400 overpass. Turn right onto Wallace Road and go about 11 miles south to 14000 Road. Turn left go through the middle gate to campground. From the 69 and 400 Jct. Go west 25 miles to Wallace Road. Turn left go about 11 miles south to 14000 Road. Turn left and go through the middle gate to the campground. Some wood. Bring your own water. Saturday night supper main dish furnished by club. Everyone bring a side dish or desert. Sunday morning breakfast of biscuits and gravy provided. Only one entry per person. Primitive dress required to shoot. No visible jeans or tennis shoes. Some loaner clothes will be available. Targets must be turned in by 4:00 p.m. No exceptions. Do not load from horn or flask. No drinking No smoking No illegal drugs on the firing line; violators will be asked to leave. Most consecutive hits will be tie breaker. Mark your calendar today so you don’t miss the next Chief Black Dog’s Trail Muzzleloader Club Spring Rendezvous the last weekend of April just west of Oswego, Kansas.